Never head out for adventure without our Ultralight Backpacking Tarp that keeps you and your equipment dry when mother nature strikes. Regardless of if you are on a hiking trip to the mountains, at a music festival, backpacking through Europe or just camping with friends, it's important to insure you have proper protection when you need it! That's why we created the OpenWorld Outfitters Ultralight Backpacking Tarp made with highly-durable, weather-resistant rip-stop technology. Produced and tested by active Military Members that enjoy adventure as much as the next person, this tarp is a must for all outdoor experiences. Designed to resist everything mother nature can send your way, this small, yet effective tarp fits conveniently inside a jacket pocket, survival pack, camping bag, or even your car's glovebox. It's tear and puncture resistant, sand proof, water resistant, and it can help keep you and your gear off hot sand or cold ground for better safety. Along with being extremely durable, it features tie-down corners with solid-steel carabiners to make for an easy and effective securing method. This lets you use it as a rain fly, tent cover, ground tarp, bivy cover, impromptu shelter and more! So protect yourself while traveling outdoors; get the OpenWorld Outfitters Ultralight Backpacking Tarp and never get caught unprepared. Click 'Add to Cart' now to get the perfect backpacking, camping and outdoor tarp that you can take with you wherever you go! MULTIFUNCTIONAL: Our Backpacking Tarp can be used for countless activities such as Backpacking, Camping, Traveling, Beach, Picnic, Festivals, Parks, Car Seat Covers, Sun Shade, Rain protection and more. Our tarp needs no additional gear to be exactly the piece of equipment you need! COMPACT & LIGHTWEIGHT: Our Ultralight Backpacking Tarp is extremely compactable and is perfect for backpacking. It fits in your pocket or backpack easily without noticeably adding weight. DURABLE: Our Ultralight Backpacking Tarp is made from High Density Nylon, is tested by hikers, hunters, backpackers and outdoor lovers in various climates. This tarp has proven to be useful and very practical in the field. This Tarp is Water/Sand Repellant, Scratch and Puncture Resistant. EASY SETUP: This (60x56in) Tarp is extremely easy to setup, simply remove from the Water Resistant Carry Sack, unfold and use! 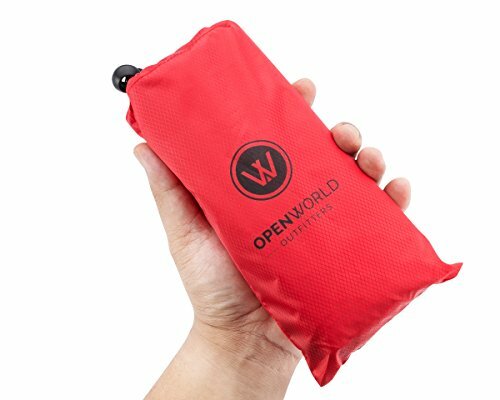 GREAT GIFT: OpenWorld Outfitter's Ultralight Backpacking Tarp is great for all ages! Anyone that enjoys being in the outdoors would enjoy this Tarp as a gift for any occasion! Every product is backed by superior quality and reliability, as well as a true satisfaction guarantee for quality assurance. If you have any questions about this product by OpenWorld Outfitters, contact us by completing and submitting the form below. If you are looking for a specif part number, please include it with your message.